The Suzuki Method of Talent Education is based on Dr. Shinichi Suzuki's view that every child is born with ability, and that people are the product of their environment. According to Dr. Suzuki, a world-renowned violinist and teacher, the greatest joy an adult can know comes from developing a child's potential so he/she can express all that is harmonious and best in human beings. Students are taught using the "mother-tongue" approach. Now available as Book & CD kit. 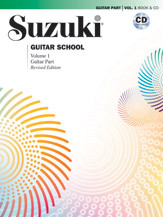 Contents include:: Principles of Study and Guidance * Basic Technique * Twinkle, Twinkle, Little Star: Variations and Theme (Shinichi Suzuki) * Lightly Row (Folk Song) * Go Tell Aunt Rhody (Folk Song) * Song of the Wind (Folk Song) * May Song (Folk Song) * Allegretto (M. Giuliani) * Perpetual Motion (Shinichi Suzuki) * Rigadoon (H. Purcell) * Are You Sleeping, Brother John? (Folk Song) * French Folk Song (Folk Song) * Tanz (J. Führman) * Tanz (J. C. Bach) * With Steady Hands (F. Longay) * Meadow Minuet (F. Longay).